As we have read in previous articles, eating cholesterol-rich foods does not raise your cholesterol. If you eat too much cholesterol, your body will just produce less to compensate. But there are some foods that will raise your cholesterol. In the the prior two articles, we looked at two foods that will raise your cholesterol levels: trans fats and fructose. In the final article of the cholesterol food raising series, we are going to look at a major cholesterol concern: the imbalance between omega 3 and omega 6 fatty acids. Omega 3 and omega 6 are both essential fatty acids, which means our body cannot produce them, we have to eat them. In a perfect food world, we would eat omega 3 and omega 6 in equal amounts and ingest a 1:1 ratio. In today’s food reality, however, that is rarely the case. Today many of eat 20-50 times more omega 6 than omega 3. That’s because omega 6 oils are commonly used for cooking and are prevalent in processed and restaurant foods, while omega 3 is taken in through eating fish like salmon, meat, eggs and vegetables. We just can’t eat enough of those to offset the omega 6 that we take in today. Research shows that 99% of us are omega 3 deficient, and a recent study at Harvard directly linked omega 3 deficiency to death in an estimated 72,000-96,000 people a year. To put that in context, there are approximately 40,000 deaths a year due to breast cancer; this makes omega 3 deficiency something we need to pay attention to. Omega 3s help reduce internal inflammation, which is linked to most every chronic condition that plagues us including – and especially – heart disease. They play a very important role in heart health as they inhibit the thickening of the arteries, lower the amount of lipids that circulate in our bloodstream, and help the arteries to relax. They also help reduce obesity by stimulating the hormone leptin which regulates food intake, body weight and metabolism, and they help prevent cancer cell growth. In addition to directly impacting coronary heart disease and stroke, omega 3s can help reduce depression, improve mental clarity and focus, reduce dry or itchy skin, hair and nails, and help prevent autoimmune disorders and type 2 diabetes. Omega 3 is an essential fatty acid; it is essential because our bodies can’t make it. Fatty acids fall into three groupings: saturated, monounsaturated, and polyunsaturated. Let’s take a brief look at the science behind it so you can understand why it matters. Each type of the three fats is made up of carbon atoms with hydrogen atoms to fill in the spaces around them. Saturated fatty acids are acids where all of the spaces around the carbon atoms are completely filled, i.e., saturated. As a result, they are very stable regardless of temperature. They are found mainly in dairy, red meat and chicken, but also in tropical oils like red palm oil and coconut oil. We can also make some saturated fat from eating carbohydrates. One reason saturated fat may have been labeled a bad guy is that the meat and milk we ingest today is very different than that which we consumed one or two generations ago. Meat today is bombarded with growth hormones, antibiotics, environmental toxins like pesticides. These toxins remain in the fat cells of the animals we eat. When we eat them or drink their milk, we take in all of this and the result is health problems including low grade inflammation. Just as we discussed before, occasional ingestion is fine, but when we eat large quantities every day, the inflammation is ongoing and this leads to an increased likelihood of oxidation and heart disease. Small amounts of grass fed meat and milk products will not lead to heart disease and can definitely be part of a balanced diet. So don’t take this as license to go eat a 16 oz porterhouse every night! But by all means, don’t stress about occasional meat or dairy and lose the guilt over a pat of butter on your vegetables. It won’t hut your health or your waistline to ingest good fats in moderate amounts. Another finding was that if people cut back on saturated fats and replace them with polyunsaturated fats, they may improve their heart health. For every 5 % in total calorie intake from polyunsaturated fats the study participants’ risk of heart attack or heart-related death fell 10%. And the longer their diet remained polyunsaturated rich, the greater the benefits for heart health. Ok, more on this in a minute. Let’s get back to our discussion about fats. As a result, these acids are usually liquid at room temperature and are relatively stable, though not as stable as saturated fats because they are not packed as tightly. The most common monounsaturated fat is oleic acid and examples are olive oil, avocados, peanuts, cashews, pecans and almonds. Your body can also make monounsaturated fat from saturated fat as needed, another reason not to be afraid of saturated fat. Polyunsaturated fats are missing several hydrogen atoms and they have two – or more – double bonds. As a result, since there are more than one double bond, they are called poly, meaning many. At each double bond, there is a kink in the chain, so they tend to be very loosely packed and remain liquid, even in colder temperatures. The good polyunsaturated fats are found in whole food sources such as nuts, seeds, fish, algae, leafy greens and krill. These are the foods that Dr. Krauss was encouraging we eat more of that have health benefits for us. When they turn rancid, free radicals are created which travel around in your blood causing damage to just about everything they interact with. Free radical damage has been tied to cardiovascular disease, autoimmune diseases, Alzheimer’s, Parkinsons’s, cataracts, tumors, and aging. The most common polyunsaturated fatty acids are omega 3 and omega 6 fatty acids. They are called essential fatty acids because our bodies cannot make them; we must get them from the food we eat. But while polyunsaturated and monounsaturated fats are good for us, some are better than others. The ones higher in omega 3 and the ones less likely to turn rancid, the ones found in whole foods rather than processed oils, are all good for us. But high heat processing of omega heavy oils is not desirable and not a good healthy fat source as we’ll see in just a minute. So we started off by saying omega 3s can do a host of good. But let me just detour for a moment and share with you that rancid omega 3s can do a lot of damage. We need them, but we need to ensure that they do not turn rancid in our bodies. Antioxidants will mitigate this impact in the body, so regular antioxidant intake along with your omega 3s is a great preventive measure. 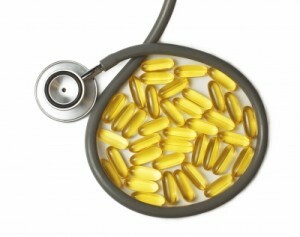 Since fish oil is low in antioxidants, that is one reason why people like krill oil as an omega 3 supplement. Krill oil in addition to being a very pure omega 3 source contains antioxidants to help mitigate any free radical damage that may occur if oils turn rancid in your body. Let’s go back to omegas 3 and 6. We need both of these essential fatty acids. The problem is that in today’s food supply, omega 6 acids are used heavily in processed foods. Vegetable oils such as corn oil, sunflower, soybean, cottonseed and safflower oil contain at least 50% omega 6 and very little omega 3. Corn oil, for example, has a ratio of 60:1 omega 6 to 3, while safflower oil has a ratio of 77:1. In addition, factory farming reduces the amount of omega 3s in meat, fish, eggs, and vegetables, and increases omega 6 because it is the base of most animal feed, also contributing to the imbalance. A chicken that is free to eat its normal diet of grass and bugs will lay an egg that is a perfect balance of omega 6 to omega 3. However, the traditional vegetarian grain fed chicken will yield an egg that is more like 20:1 omega 6 to 3. Nature undisturbed knows to work in perfect balance, but our changes in farming have disrupted that balance and left us with an overabundance of omega 6 in our diets. Ideally, we need a 1:1 ratio of omega 6 to 3, but up to a 4:1 ratio our bodies can still cope fairly well. Unfortunately, the typical American diet is more like a 20:1 up to a 50:1 ratio of 6:3 and that is why it is so important to eat more and supplement with omega 3s. Not only do we need them in isolation, but we need them to be in balance together with our omega 6 intake and our current diet is highly imbalanced in favor of omega 6s. An imbalance will prevent all the wonderful health benefits we mentioned earlier from omega 3s from occurring. In addition, too much omega 6 versus omega 3 has been shown to lead to inflammation, heart disease, weight gain, sterility, high blood pressure, digestive concerns, blood clots, inhibited immune function, and even cancer. We covered a lot in this article series so let’s sum this all up. If you eat trans fats, fructose, or a processed food diet heavy in omega 6, cholesterol levels will be higher as a result because cholesterol is stepping in to try to help our bodies deal with the inflammation and the imbalance that ingesting these substances create. Forcing cholesterol levels higher to deal with these choices is not in our body’s best interest; so we should avoid eating these. Artificially forcing cholesterol down without removing the cause simply inhibits the body’s ability to heal. It’s the old don’t shoot the messenger! Cholesterol is necessary for the body to deal with our choices: cholesterol isn’t the bad guy. In each case, it is helping our body to deal with the true bad guy: it’s a reflection of what is going on as our body tries to stay healthy, not an enemy. We need to address the cause and remove these harmful substances from our diets so they don’t force our bodies to dispatch cholesterol continually to deal with their impact. That means limiting fructose consumption (no high fructose corn syrup! ), avoiding trans fats (no products containing hydrogenated or partially hydrogenated oil; even if the label says trans fat free, check for hydrogenation!) and balancing omega 3 and omega 6 intake. Balance can be achieved by avoiding vegetable oils and processed and restaurant foods which are heavy in omega 6. Taking in good quality omega 3 such as eggs from chickens allowed to eat a natural diet (not vegetarian feed), wild sockeye salmon, grass fed meat and supplementing with a high quality omega 3 or krill oil will help restore balance and reduce internal inflammation.